Each reducer is made from high strength steel. 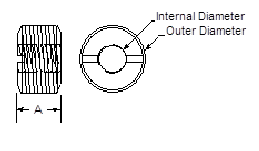 The outer thread of the reducer is made from a rolled class 2A thread. The rolled thread increases the strength while reducing micro-cracks. The internal thread is bored and tapped to a class 2B thread with machine chamfered ends. One end includes a machined slot for ease of assembly.